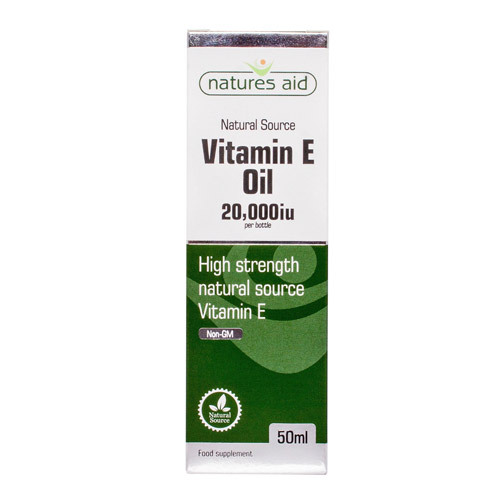 Natures Aid Vitamin E Oil is suitable for use as part of your daily beauty regime and contributes to the protection of cells from oxidative stress. Many of Vitamin E`s beneficial protective effects are attributed to its antioxidant activity. As the body`s principle fat-soluble antioxidant, Vitamin E neutralizes hazardous molecules called free radicals, which are found in pollutants and as the by-product of metabolism. Natures Aid have been manufacturing and supplying quality nutritional supplements to the Independent retailers for 30 years. Our Philosophy has always been to provide high quality, effective nutritional supplements to help preserve and maintain optimum health. Medium Chain Triglycerides (fractionated coconut oil), Vitamin E Prep. (d-alpha Tocopheryl Acetate, Sunflower Oil). Take 1-2ml per day. Alternatively use as a moisturiser and apply to the skin as required. Keep out of reach of young children. Store in a cool, dry place. Below are reviews of Natures Aid Vitamin E Oil 20,000iu - 50ml by bodykind customers. If you have tried this product we'd love to hear what you think so please leave a review. Impressed with this Vit E oil which I use tiny amounts on my skin to help with sore/dry skin and age spots.